Coal, steam, and human power helped bridge the gap between the machines that kicked off the industrial revolution and the advent of electricity and internal combustion engines, but in some places, man's best friend provided the power that kept machines moving. The image up top comes via Peter Maniate, a Newfoundland breeder who points to a few of the devices dogs—as well as goats and sheep—powered. Patents from the 19th century give us images of treadmills, carousels, and massive hamster wheels that enabled dogs to power sewing machines, mills, grindstones, lathes, butter churns, blacksmith's bellows, and water pumps. In England, a special breed of dog, the Turnspit Dog, was bred with a long body and short legs perfect for running a turnspit for roasting meat. This image, via the Daily Mail, appeared in the 1882 book Popular Scientific Recreations. 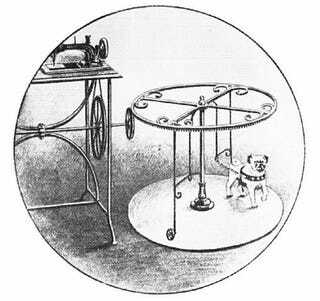 It depicts another canine-powered sewing machine, this one devised by Frenchman M. Richard. According to Maniate, however, angled treadmills were the more popular way to harness dog power as they utilized the pooch's weight in powering the machines.